Before wedding planning, walking down the aisle and honeymooning, there’s usually a beautiful engagement ring involved. Coveted current trends include rose gold, unconventional settings, colored gemstones and a nod to classic style. One thing is for sure, there’s never a shortage of inspiration for awe-inducing baubles! There’s been a resurgence in colored gemstones in recent years and ladies are getting creative when they cultivate their dream rings. This yellow center stone looks radiant nestled around a halo of pavé diamonds. No matter how creative we get with metallics, yellow gold will always be a timeless metal. This emerald-shaped diamond shines with a halo setting. 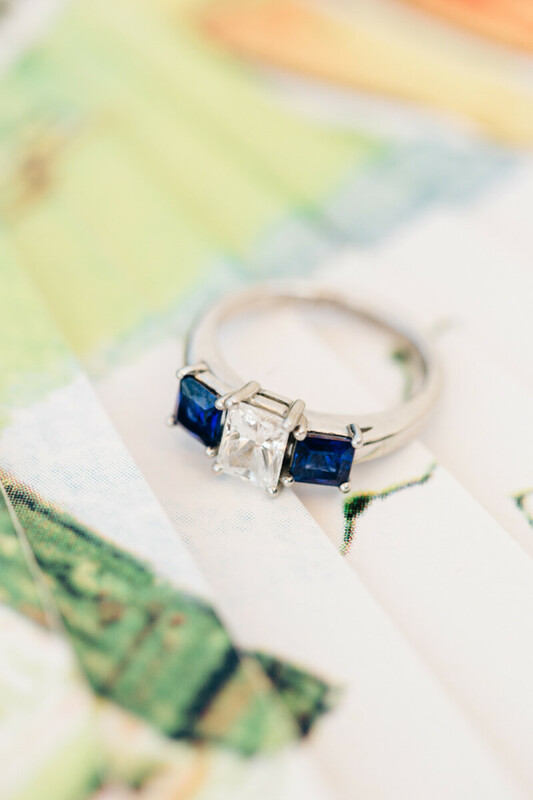 Statement colored sapphires like these can evoke sentimental style - the bride's favorite color, her birthstone or a stone representative of something in her life. With a center diamond, this is an engagement ring with a colorful splash. Solitaire diamonds can be more expensive but they are worth the investment. Their classic impression will never go out of style, and proves time and time again that as trends come and go, these designs still have their place. For an ultra-feminine bride, a pink-hued stone looks impeccable with rose gold. And makes a stunning set with a thin rose gold band dressed in diamonds. The three-stone setting isn’t a new concept but turning the setting around is definitely inventive! This emerald setting with small diamonds on each side faces a new direction and gives a whole new look to a classic style. Whether you’re modern and contemporary, or prefer traditional styles, every engagement ring is beautiful. Research different styles to figure out what speaks to you. And there’s no harm in dropping hints to that special person in your life!